My 15 year old brother just moved in with us because my mom couldn't deal with him anymore, but he is doing great! He's only been here a month and already has a lady friend, got a haircut, started youth group and is in wrestling. I also have 2 dogs! Thor (aka mr. Punk) is a power house! He's mixed breed and trained to KISS! also we have 2Stitch who is part collie. He's just awesome, and absolutely loves to fetch. 2Stitch is the fluffiest cuddle bug too! As for work, I work at a hay mill, where we dry hay, chop it up, and make it into alfalfa pellets. I've learned how to drive almost every tractor/truck there within a year. 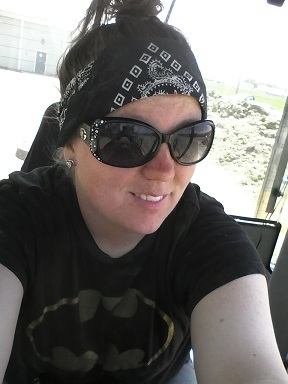 My job is Loader Operator, and it's long hours in the summer. We are never even guaranteed a day off until winter! But its pretty fun. Well I pretty much have what I want in life. It's just a lot of hard work to have it, and keep it! Any questions, ask! Otherwise keep it real and like it up!